As dawn breaks over the Atlantic Ocean near Launch Pad 39A at NASA's Kennedy Space Center in Florida, a banner proclaims the sentiments of the work force at Kennedy Space Center following the rollout of space shuttle Discovery to the pad. Discovery is set to launch Feb. 24, 2011 on the STS-133 mission. This story was updated at 5:41 p.m. EST. CAPE CANAVERAL, Fla. – NASA is expecting good weather and an enthusiastic crowd of spectators for the space shuttle Discovery's last-ever launch this Thursday (Feb. 24). 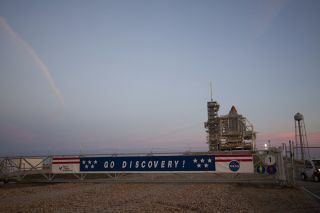 Discovery is slated to lift off on Thursday at 4:50 p.m. EST (2150 GMT) from a seaside pad here at NASA's Kennedy Space Center. Current weather forecasts predict an 80 percent chance of favorable conditions for Thursday's launch. "Weather is looking very good – we've had some great weather coming up to the launch," said shuttle weather officer Kathy Winters. "On launch day, everything looks good right now." "It's been an interesting, and exciting and probably challenging few months for us," NASA test director Jeff Spaulding said in a mission status briefing this morning. The shuttle's six-astronaut crew arrived at the launch site yesterday. Discovery will launch just hours after an unmanned European cargo ship, called the Automated Transfer Vehicle-2 Johannes Kepler, will dock at the space station. "We'll be watching that closely," Spaulding said. "If there are any issues with docking, the program will go off and assess at that time." While forecasts look promising for Thursday, the weather may become more of a concern if Discovery's launch is delayed, Winters said. Forecasts beyond Thursday show a chance of showers in the area and low clouds, which could affect the shuttle's ability to get off the ground. Still, the workers here at Kennedy Space Center are working hard to prepare Discovery for her final voyage into space. "The people that have worked on this team have loved this vehicle for many, many years," Spaulding said. "It's a bittersweet thing for them to say goodbye to her for her last mission." Spaulding also noted that this is one of the longest periods of "vertical flow" for the shuttle Discovery – the number of days in between when the vehicle is rolled out of its hangar-like Orbiter Processing Facility and launch. The longest vertical flow period was during prelaunch preparations for the space shuttle Columbia's STS-35 mission, Spaulding said. The shuttle spent 183 days in the upright launch position before STS-35 lifted off on Dec. 2, 1990. For the upcoming STS-133 mission, Discovery was rolled out of the Orbiter Processing Facility on Sept. 9, 2010. It initially moved to the launch pad for a November launch, but was returned to NASA's cavernous Vehicle Assembly Building - where shuttles are attached to their fuel tanks and solid rocket boosters - for repairs. NASA returned Discovery to the launch pad on Feb. 1. If the shuttle launches as planned on Thursday, the vehicle's vertical flow period will amount to 170 days. On its 11-day mission, Discovery will haul critical hardware and spare parts to the space station, including a storage room and a humanoid robot assistant named Robonaut 2. Discovery's upcoming flight will be the shuttle's 39th and final voyage into space before NASA retires its orbiter fleet later this year. "Discovery has been a really remarkable vehicle for us and the program," Spaulding said. "She still has a few more miles to go before she sleeps, though. She's taken us on many amazing journeys throughout the years and we expect this flight to be no different from any of those."